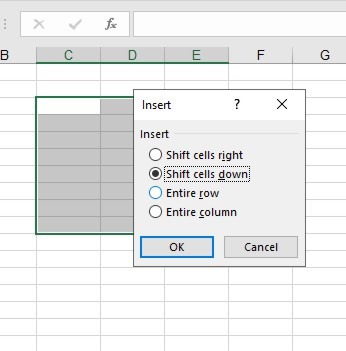 For us to Insert Cells in a Spreadsheet, we must select the area of Cells that we need to Insert as shown in the image below. The number of Cells selected, the same amount will be Inserted in our Spreadsheet. Once the area of Cells is selected, there are two ways to Insert Cells. The first one, is to do a right click with our mouse on top of the selected area, and then from the shortcut menu that appears, we select the command Insert as shown below. The second way is from the Home tab, we locate the area named Cells of the ribbon as shown below and then we select the command Insert and from the drop-down menu we select the command Insert Cells. 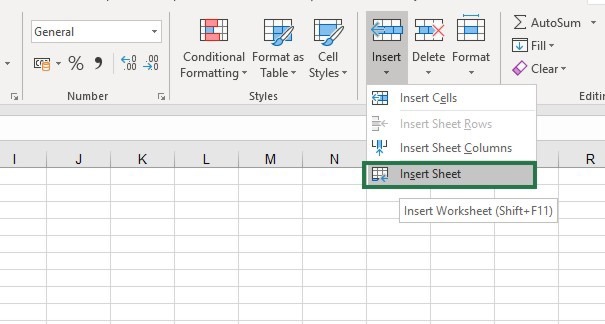 For us to Insert Rows in a Spreadsheet, we must select the number of Rows that we want to Insert. When we Insert Rows, the same number of Rows selected will be inserted of the top of the selected Rows. 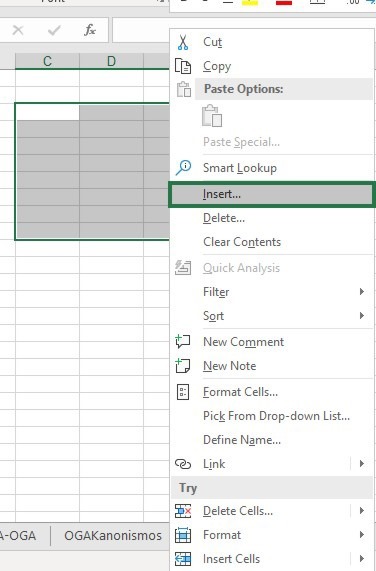 The first way to Insert Rows, is to do a right click with our mouse on top of the selected Rows and then from the shortcut menu that appears we select the command Insert. The second way is from the Home tab, we locate the area named Cells of the ribbon as shown below and then we select the command Insert and from the drop-down menu we select the command Insert Sheet Rows. As mentioned above, the same number of selected Rows will be Inserted above the selection. For us to Insert Columns in a Spreadsheet, we must select the number of Columns that we want to Insert. When we Insert Columns, the same number of Columns selected will be inserted at the left of the selected Columns. 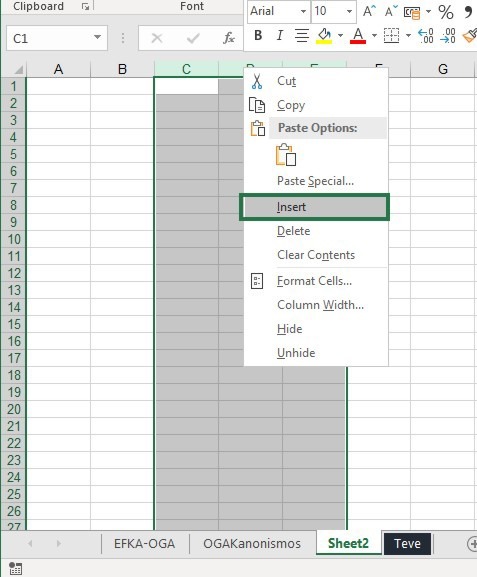 The first way to Insert Columns, is to do a right click with our mouse on top of the selected Columns and then from the shortcut menu that appears we select the command Insert. The second way is from the Home tab, we locate the area named Cells of the ribbon as shown below and then we select the command Insert and from the drop-down menu we select the command Insert Sheet Columns. As mentioned above, the same number of selected Columns will be Inserted at the left of the selection. For us to Insert a Spreadsheet in our Workbook, the first way is to move on top of a Sheet that already exists in our Workbook, and then do a right click with our mouse. 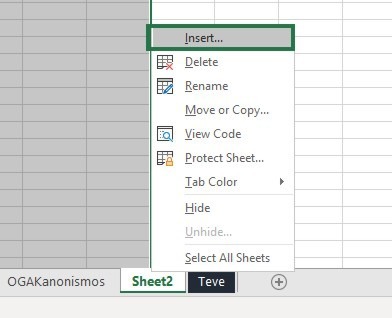 Whenever we Insert a Spreadsheet in our Workbook, the Spreadsheet will be inserted at the left of the selected Spreadsheet. From the shortcut menu that appears we select the command Insert as shown in the image below. The second way is from the Home tab, we locate the area named Cells of the ribbon as shown below and then we select the command Insert and from the drop-down menu we select the command Insert Sheet. As mentioned above, the Spreadsheet will be Inserted at the left of the selected Sheet. Worksheet, Chart, MS Excel 4.0 Macro, International Macro Sheet, MS Excel 5.0 Dialog and many more. We select the Sheet that we want and need to Insert and the press the Ok button located at the bottom right corner of the Insert dialog box. 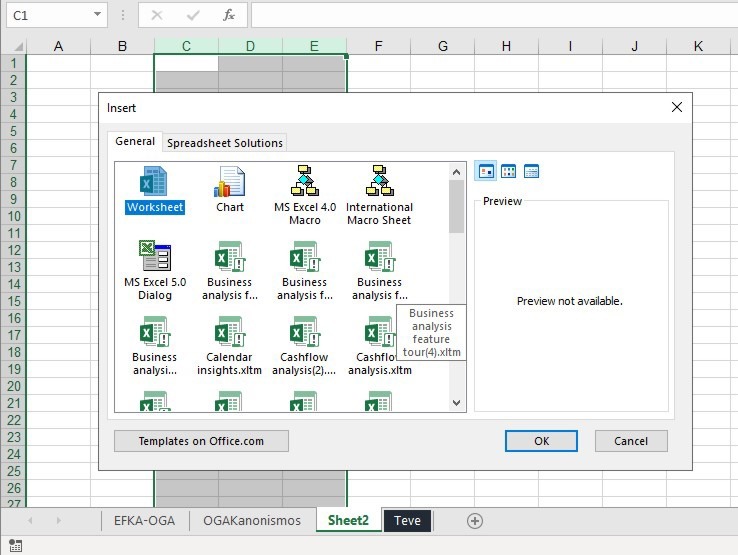 Below you can check out the video describing How To Insert Cells, Rows, Columns and Spreadsheets in an Excel Workbook. 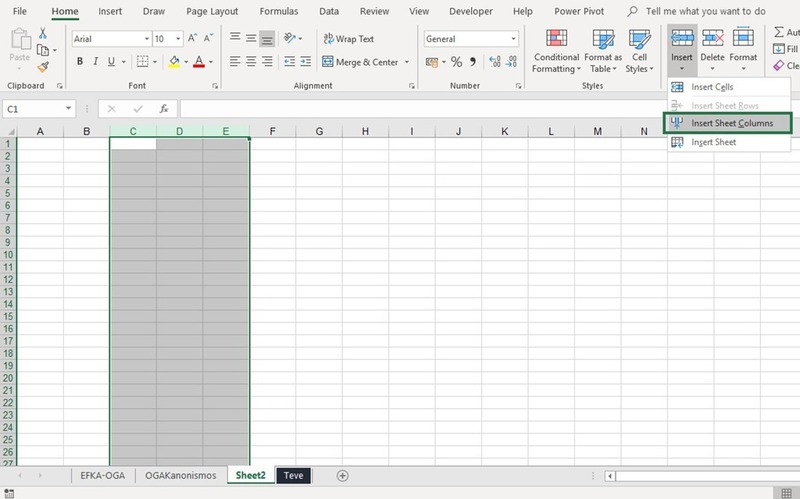 Posted on March 4, 2019, in Excel 365 English, Microsoft Office 365 ProPlus English and tagged Cell, Cells, Chart, Column, Columns, Columns and Spreadsheets in an Excel Workbook?, Entire Column, Entire Row, Home, How To, How To Insert Cells, Insert Cells, International Macro Sheet, Know How, Microsoft Excel, Microsoft Office, Microsoft Outlook, Microsoft PowerPoint, Microsoft Word, MS Excel 4.0 Macro, MS Excel 5.0 Dialog, My YouTube Channel, Office Smart, Office System, OfficeSmart, philippospan, Row, Rows, Shift Cells Left, Shift Cells Right, Smart Office, smartoffice, Spreadsheet, Subscribe, Tip & Tricks. Bookmark the permalink. Comments Off on How To Insert Cells, Rows, Columns and Spreadsheets in an Excel Workbook?.